Department of Pharmaceutics, Indian Institute of Technology, Banaras Hindu University, Varanasi-221005, Uttar Pradesh, INDIA. Context and Aim: Exacum lawii (Gentianaceae) is bitter folk medicinal herb. The study deals with molecular investigation by DNA fingerprinting profile of Exacum lawii, quality control and phytochemical standardization of Exacum lawii. Methods: The DNA fingerprinting profile was performed by RAPD technique using 3 pairs of primers. The quality control standardization was done as per the WHO guidelines and official methods of AOAC. Phytochemical standardization employed quantitative estimations of phytoconstituents by spectrophotometric and identification using GCMS technique. 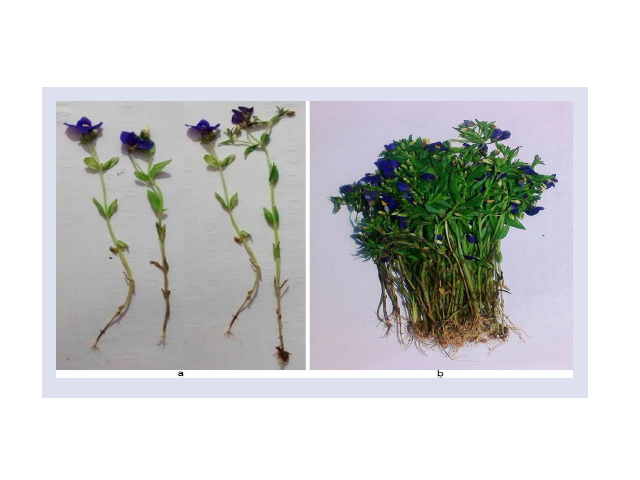 The quantification of Swertiamerin and Ursolic acid in Exacum lawii was carried by HPLC. Results: Macroscopical and microscopical examination confirmed the diagnostic morphological and histological features. The content of vitamins, minerals and fatty acids were estimated. Physicochemical parameters obtained within the provided limits as per WHO. The phytochemical screening of ethanolic extract and its fraction revealed the presence of alkaloids, flavonoids, phenols, tannins, terpenoids, glycosides and steroids Total phenolics (57.4mg/g tannic acid equivalent), total tannins (15.3 mg/gm), total flavonoids (51.4 mg/gm rutin equivalent), total flavonols (5.4 mg/gm) and carbohydrates (12.6 mg/gm D-fructose equivalent) content were estimated using spectroscopic techniques. The GC-MS data revealed 20 compounds. Swertiamerin and Ursolic acid content was 119.59 mg/gm and 5.34 mg/gm respectively. Conclusion: Present study provides the referential information to develop a monograph for quality control standardization of Exacum lawii. Key words: Exacum lawii, DNA fingerprinting, Swertiamerin, Ursolic acid, GC-MS.
Freshly collected Exacum lawii whole plant. Sharma S, Hemalatha S. DNA Fingerprinting Profile and Quality Control Standardization of Folklore Medicinal Plant Exacum lawii. Pharmacognosy Journal. 2017;9(6):775-785.